Nipton's new swimming hole is under construction, booze is returning to the restaurant and lottery tickets are being sold again at the ghost town's general store. But it likely will be some time before those buds of green and gold that tokers really want are lining the shelves of stores in the California desert town, whose owners envision turning it into a marijuana-themed resort destination. "We're putting that on the back burner for now," David Gwyther, president of the cannabis technology company American Green, told The Associated Press on Tuesday. 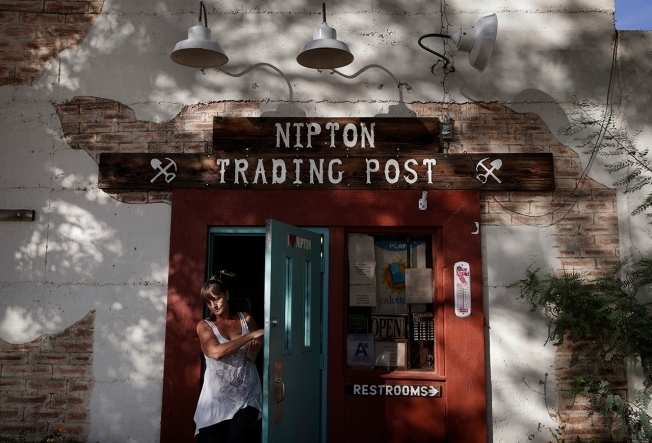 He added that, like other cannabis entrepreneurs, Nipton's owners have discovered that even after California legalized recreational marijuana on Jan. 1, meeting the myriad of regulations to obtain a license to sell it is not easy. So while the 80-acre town's owner confronts those legal challenges, it is moving forward with renovations to Nipton's Old West-styled hotel and other buildings on the edge of the Mojave Desert. Although American Green sold the town to the exploratory drilling firm Delta International Oil & Gas for $7.7 million earlier this month, Gwyther said American Green controls that company too, adding the move was akin to moving Nipton "from one pocket to another." At the same time, he said Delta's stock-trading status as a fully reporting company puts it in a better position to raise money for the town's development. When American Green purchased Nipton for $5 million last year it announced ambitious plans that included transforming the hotel into a "buds and breakfast" inn and bottling and selling cannabis-infused beverages. It also planned to attract cultivators and marijuana-theme boutique owners such as glassblowers. "We still want people to feel comfortable using cannabis," Gwyther said Tuesday, adding people 21 and older will be encouraged to toke up privately. "It's going to be the kind of environment we call cannabis hospitality." Nipton recently got its liquor and lottery sales licenses transferred and the latter is proving a big income generator for a town an hour outside of Las Vegas, where lottery sales are not allowed. "Over 100 people were waiting for the store to open last week when the Powerball jackpot got up to $480 million," Gwyther said.